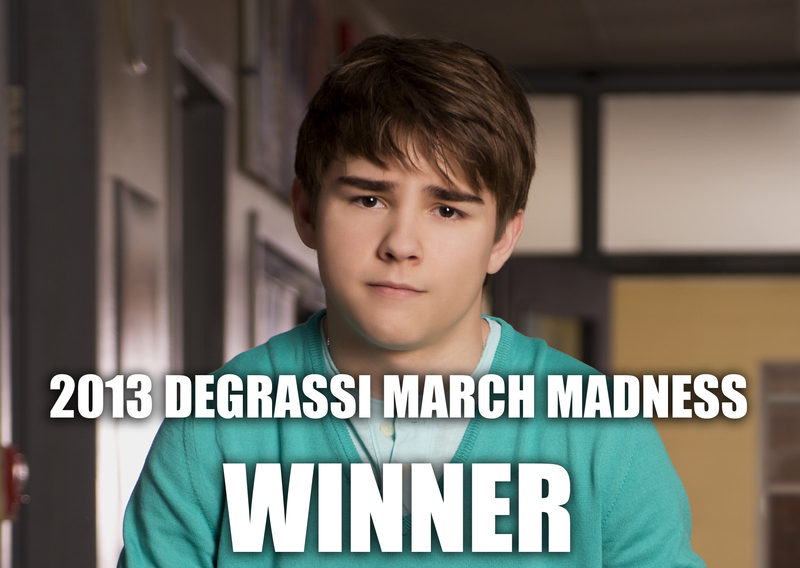 Cam outlasted 63 other Degrassi characters to become this year’s champion. 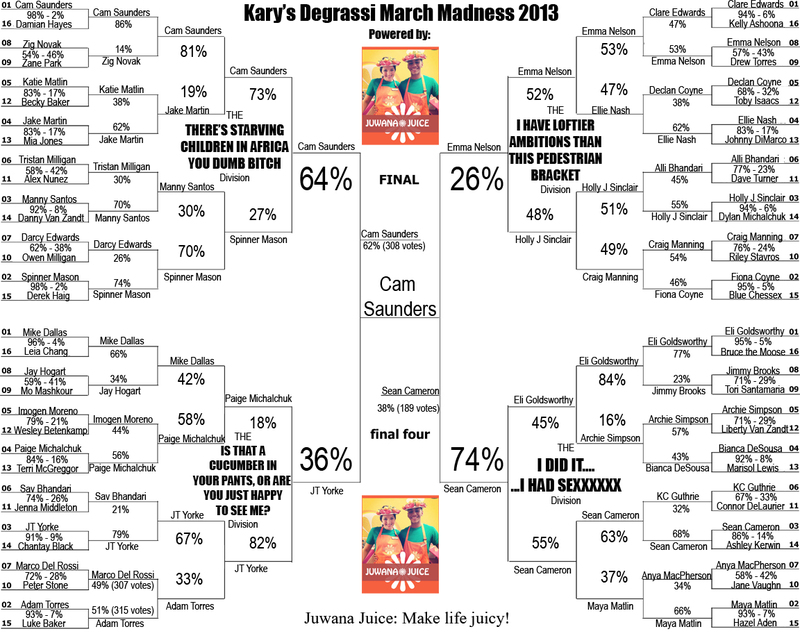 Because of the timing of his death and March Madness, it’s not even remotely shocking that he won. We could do this same tournament next year, and I guarantee the results would be different. You received 10 points for each correct choice this round. The madness is FINALLY over! No more Emma, huzzah! Don’t hate me for this folks, but do you all honestly think that Cam would have made it to the finals if he was still alive? Who knows? He was already extremely popular long before his death. Kinda, yeah. Spinner was Cam’s first worthy opponent- that was hard. But, I think Cam had a strong fanbase and probably would’ve won against Spinner anyway. I couldn’t see Cam beating Spinner and then losing to JT. Cam wasn’t here for long, so the writers didn’t have a chance to screw up his character or storyline. Cam’s character was consistent, and consistently strong. His suicide may have made the trail to victory easier, but I think he had a damn good chance anyway. I think it’s tough to compare the newer characters with the older ones. Season 10 was a huge turning point and the show is just different now in so many ways. Characters leave us now faster than they used to, so it’s hard to get over the bonds we formed with the original characters… but were the originals really better, or is nostalgia playing with our judgment? I think Paige v Dallas is a good example of that- I think Dallas is a better character, but Paige won because she’s a “classic.” It’s probably the same reason Emma got so far. everyone will probably hate on me, but idc. so answering your question, no i don’t think he would have won if he wasn’t dead. i mean, he was an amazing character, but in all honesty i didnt really appreciate him until i knew he was about to die. J.T. probably would have beat Cam if he didn’t commit suicide but I think he would still be somewhere in the top 4. If Cam were still alive, he would have made it through most rounds… but he wouldn’t be in the finals. Gah!! Second place! Alas. Congrats, Shelby! A lot of people who watched and loved the earlier seasons don’t really watch the show anymore. And a lot of the “newcomers” don’t seem to appreciate the older episodes much. So…I’m not sure if it was quite fair to compare the new characters with the old one. I mean…Cam winning is a little strange IMO (and, yes, I understand the importance of his suicide story lines but still…). Looking at these results, it seems like it was mostly newcomers voting I think there should have been a season 1-7 bracket and then a season 8-12 bracket.